When To Move On | Mediterra - Swim & Run Better Than Ever! Here is re-post of a response I gave on the new TI Academy discussion forums. (If you haven’t heard about the TI Academy yet, let me know and I will explain it to you and add you to the mailing list). It’s a great question – How do I know when to move on from a certain drill? A drill is an activity that isolates a certain skill, allowing you to concentrate on it with less demands on your attention and neuro-muscular control. It can isolate that skill by putting you in position to turn off other skills, and by slowing things down so it is easier to focus on little details. Ultimately, drills are meant to make your whole stroke swimming better. To do this you need to gradually add more whole stroke in order to test and integrate that skill which the drill is meant to build. We’ve got two objectives with drills – 1) to imprint the skill, and 2) to expand it. We can use an analogy to understand these. 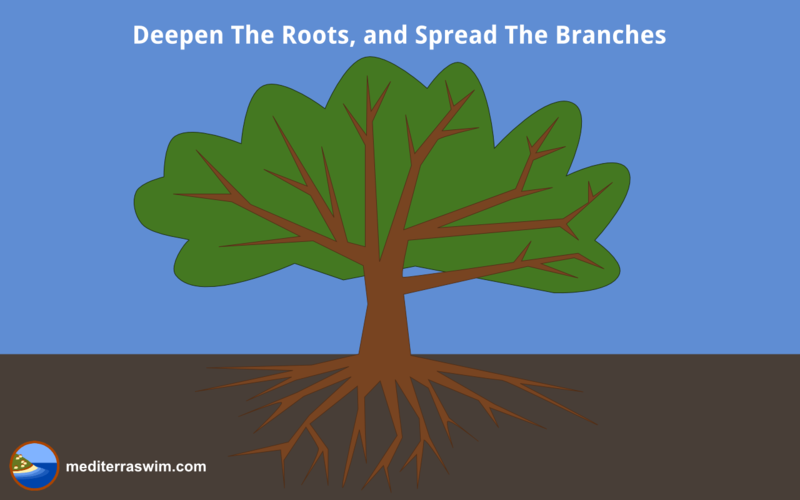 #1 is like spreading the roots on the tree, and #2 is like spreading the branches. By spending time in a drill (or in whole stroke) within our comfortable skill range, we deepen the roots. That successful, comfortable (but mindful) repetition stimulates the strengthening of the neural pathways that control that skill. When we add some complexity to the drill or move to whole stroke with some challenges added, we provoke the branches to reach out further- we provoke our brain/body to expand its skill (the brain recruits more neurons to help with the task). You need deep roots, or deep imprinting through a lot of successful repetition in order to make that skill so resilient that it holds up under pressure (of racing, of higher tempo, longer distance, more intensity, tougher conditions, lower energy, etc). Then you can repeat that same sequence with Focal Point B, and then C, etc. Change the drill, change the Focal Points, change the repeats, change the distance to create an infinite variety of practice sets. As a new swimmer you may be reluctant to try whole stroke for fear of ‘doing something wrong’ – but frankly, as long as we’re all short of perfection, we’re all ‘doing something wrong’. Musicians don’t quit practicing for fear of hitting a wrong note- they use each wrong note as feedback to pinpoint where they still have work to do. But they do break the challenge down into small pieces so they limit how much they repeat obvious failures – so that small pieces of success are reached more frequently than small pieces of failure. The growth cycle requires both. So, try some whole stroke, holding focus upon some skill you’ve been working on in the drill, and though you notice some things that clearly are ‘wrong’ don’t worry. Take note and put the notes aside, then keep focus on your original objective. Later on, as you move through the skill sequence you will come to the drills that address the things you noticed were a problem. You may also find some encouragement in my blog post Train Like Michaelangelo. We work all the way through the basic skills several times, working on finer and finer details each time. It may not be so productive to attempt to perfect one part before you work out the proportions on the whole body. As you work through the skill sequence, you’ll gain more skill and you’ll gain more sensitivity – which means you’ll notice more things that need fixing each time you go through – not because you’ve diminished in skill, but because you’ve increased your sensitivity which is a sign that you actually have greater skill. Even though my stroke may be regarded as highly refined, I continually discover new things to work on even as I do Superman along side my students. We never ‘arrive’ at perfect but we continually deepen and find new treasures along the way.